Believe it or not, the new lease accounting standards are not unlike those pesky word problems you used to loathe in high school algebra. If you’ll recall, the more complex of those word problems required you to read each and every word carefully, otherwise, you risked missing an important piece of information. Failing to do so, of course, could have created a chain reaction that started with you flunking the algebra exam and ended with a rejection letter from your top college choice, relegating you to a life spent in a melancholic haze filled with what-ifs and could’ve-beens. And you’re too darn good for that, our accounting friend. So what’s our point? Any good accountant knows that you always have to read the fine print. Take those new lease accounting standards, for instance. 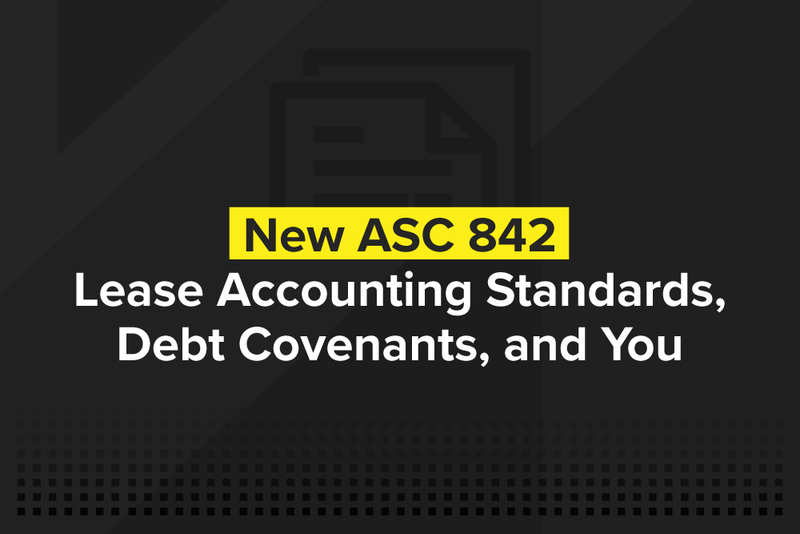 While the broad strokes of ASC 842 -- as we’ve previously discussed -- are obviously essential to understand and properly implement, so are the less discussed aspects like its impact on debt covenants. For that reason, and because Embark isn’t the sort to leave any financial stone unturned, we present you with one of the less heralded but abundantly important sides of ASC 842 and its impact on your company -- possible debt covenant issues from moving operational leases to the balance sheet. Enjoy. Although operating leases have traditionally been off the balance sheet, they are in for a dramatic change thanks to ASC 842 as they essentially disappear into the inviting arms of the balance sheet. In most instances, companies will record them as assets or liabilities going forward, creating the root of potential issues with existing debt covenants. Since those covenants are almost always based on a company adhering to specific guidelines and financial well-being -- staying within a particular range of current ratio, debt service coverage ratio, debt-to-equity ratio, amongst others -- moving lease liabilities to the balance sheet could skew those metrics and, therefore, violate debt covenants and trigger a default.Granted, the FASB states that ASC 842 characterizes operating leases as operating liabilities and not debt, thereby minimizing the impact on debt covenants. However, as both common sense and experience tell us, there’s plenty of room for confusion and chaos when standards change and people aren’t on the same accounting page. Remember, just because you understand the new standards and the FASB has eased your mind regarding ASC 842 and debt covenants doesn’t necessarily mean a lender will follow suit. Therefore, arming yourself with the pertinent lease and debt information is critical for anticipating and reacting to any possible covenant violation issues. In other words, knowledge is power. Start this process by determining how many operating leases you have and what their impact will be on your balance sheet and ratios after the new lease standards take hold of your financials. Next, carefully examine your debt covenants and look for any provisions that protect you against the impact of changes to accounting standards on your ratios. Yes, in a perfect world, all of your debt agreements will have specific language that covers such changes as ASC 842 and operating leases, typically falling under the auspices of frozen GAAP or semi-frozen GAAP clauses. However, as you already know, this is not a perfect world and it’s entirely possible that such language doesn’t exist in your agreements. In those instances, a proactive approach is your best bet in heading any issues off at the financial pass. Contact your lenders to discuss the mandated changes to the lease accounting standards, what the FASB has stated about operating leases and debt covenants, and try to come to a mutually-agreeable solution before relationships fray, inadvertent defaults knock on your front door, and your accountants start to drip beads of nervous sweat into their keyboards. Once again, knowledge is indeed power and should be shared between everyone ASC 842 impacts, both directly and indirectly. For non-public entities that still have the luxury of time, renegotiate existing debt agreements before ASC 842 becomes effective. Now that we’ve gotten the more foreboding aspects of operating leases and your debt covenants out of the way, Embark thought it best to close with a light at the end of the lease accounting tunnel. According to the FASB, the majority of lenders are not willing to dissolve a successful relationship with a company by calling a loan due to the impact of ASC 842, even when frozen GAAP clauses don’t exist within an agreement. Also, from a credit rating perspective, most agencies and analysts rely on lease-related footnotes and disclosures in financials to gauge liabilities for rating purposes. Going forward, supplying critical lease information in your financials will be vital in maintaining a healthy financial stasis and not rocking the debt boat. Simply put, Embark assures you the sky isn’t falling and you’ll be fine as long as you ease into ASC 842 with open eyes, ample information, and a clear course of action.